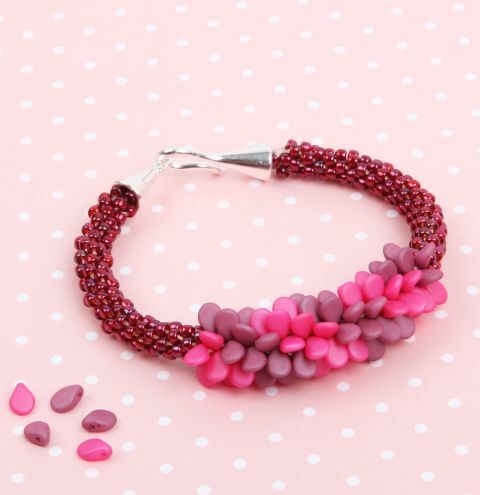 Use pretty Preciosa Pip beads as the focal point to this Summer Berry Kumihimo Bracelet! Personalise your design by picking your favourite round seed and pip beads! Pick your Preciosa pip seed beads here! Pick your size 8 seed beads here! Cut 4 lengths of cord measuring approx. 100cm each. Holding all 4 cords together, fold in the middle of the cords and knot together creating 8 ends. Place the knot through the hole in the centre of the braiding board. Spread the cords, placing them at the top, bottom, left and right on either side of the dots, in the notches of the braiding board (each cord in a notch is called a warp). Turn the braiding board over and thread on approx. 16 seed beads onto each of the 8 threads. To help you thread the beads onto the cord, take your glue and coat the end of the cord. Wait for it to dry and harden and then cut this end of the thread to a point. This will act as a needle for threading on your beads. Next thread on 10 pip beads onto each thread. Make sure to keep the same colour pips on each thread. You will have 4 cords with the raspberry and 4 cords with the vintage rose. You will have 8 cords with 16 seed beads, 10 pip beads and another 16 seed beads on them. To make the spiral effect in the image, place 2 of your bright pink (raspberry) pip bead cords at the top of the board, and the other 2 raspberry cords at the bottom of the board. Place the cords that have the vintage rose pip beads on the left and right sides of the board. Wrap each cord into its own no-tangle bobbin. You may want to add a weight to the knot to help your braid pull downwards and keep tension as you work. You should have a warp either side of dot 32. Rotate the board so you are holding this dot at the top. Take the warp from the notch to the left of dot 16 (at the bottom) and move it straight upwards to the notch to the left of the two warps at the top. You will now have 3 warps at the top and one at the bottom. Now take the warp furthest right at the top and bring it down to the right of the remaining bottom warp. Turn the braiding board 90 degrees counter-clockwise and repeat the same process, moving the bottom left warp to the top left, and the top right warp to the bottom right. Repeat this without adding any beads into your weave. Repeat until you have approx 0.5cm of your braid that will be glued into your end cap. This will be a very thin braid which you will have to thicken at the end by knotting more cord around it - so it will fit securely when glued into the end cap. Start moving beads down your threads into the braid. Each bead you move down will go under the first horizontal thread you come to and between the two threads before you continue to move the thread to the top notch. Continue to move beads into your braid until you have used all the beads on your 8 strands. Check the bracelet against your wrist and see how long it is. Allow for an extra 2cm added by the clasp. If your work is too long, take a few beads off the end. If it is too short, add a few more seeds onto each strand and continue braiding. Continue to braid after you have used your beads to create the 0.5cm braid that will be glued into the endcap. Remove cords from the notches and knot together so the braid doesn’t unravel. Repeat this on the other end so that the braid that will be glued into the end caps are thick enough to sit in the caps. When you are happy that you have secured the braid; take some sharp scissors and cut off just above the knot. make sure this will be hidden inside your clasp. When you are happy that it will fit, glue end ends into the clasp and let it dry.